The magazine front cover is one of the hardest-working pieces of paper in publishing. The best covers leap from the rack, captivate the mind and compel readers to look inside. All within the span of a few seconds. Dustin McNeal knows exactly how this works. As a decorated magazine art director, he sees the subtle, yet dynamic workings behind a great cover. When we asked him for his favorite magazine covers of the year, he did more than name five issues—he explained why they work, with takeaways for any content creator. “This cover has received a lot of press and praise, with many describing it as ‘one for the ages.’ The concept’s simple but expert execution has a lot to do with artist Jorge Gamboa’s creative restraint. Takeaway: If your message is big, say less. Allow design to speak for itself and deliver. Doing so not only sharpens your message, it displays trust in your audience and provides them space for their own internal dialogue. “Time put out a special report on drones—and how their use is transforming our world. Taking the concept to the cover, Time—partnering with Intel’s Drone Light Show team, Astraeus Aerial Cinema Systems and L.A. Drones—used a fleet of 958 drones to recreate a 100 m (328 feet) tall version of its iconic red border and logo. Yet another drone photographed their arrangement, which was the first time an image from a drone was used for the cover of the 95-year-old publication. Takeaway: Production value is more visible than you think. Thinking big elevates audience perception of your brand. “The New York Times Magazine was in a tough spot. 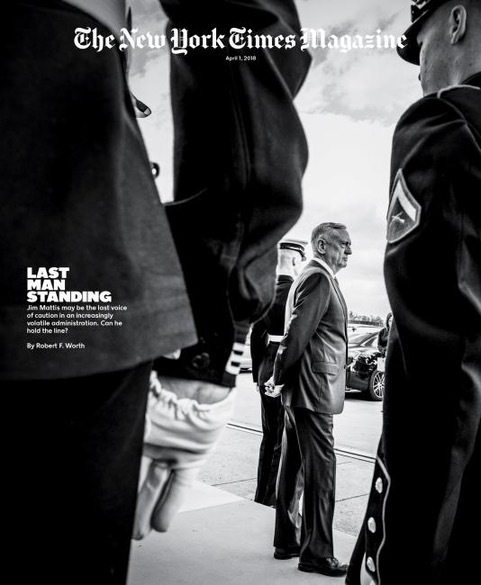 They were writing a story on Defense Secretary Mattis, a man aware of the magazine’s parent organization and its perceived opposition to the Trump administration. And because Mattis is a notoriously ‘all-work, no-play’ official, it seemed unlikely that he would sit for a portrait with The New York Times Magazine. Takeaway: If you’re telling a true story, work with your limitations to convey reality and perspective. Doing so displays authenticity and transports the viewer directly into the right context. Takeaway: Intricate design captivates on center stage. Front covers—and their digital equivalents—are prime real estate, so make sure your signature design includes only what matters. Takeaway: Embrace unique opportunities. If you have a universe of content, expand your vision to meet audience demands. Doing so not only increases product exposure, it demonstrates that your brand’s priorities align with your audience. And that’s something they’ll remember. … and one last word. All of these covers share something—they tell an entire story in a single executed movement. Whether it’s with metaphor, production value, candor or ingenuity, good design succinctly conveys the essence of an entire publication in mere seconds—turning the passerby into a subscriber. Your content should do the same. Love the idea of capturing an audience with expert design? Take the easy route—contact us to take your brand and content to a whole new level. 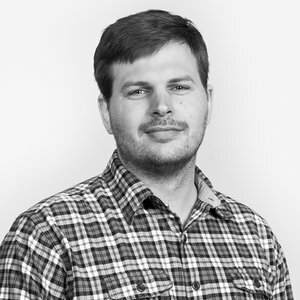 Dustin has been using his creative talents to visually build brands for the past decade—combining a passion for new industry trends with a proven ability to marry content with contemporary design. Dustin has racked up more than 30 industry awards for graphic design, advertising and layouts. He is a constant student of the editorial design and publishing industries. His active membership in the Society of Publication Designers helps keep the iostudio team abreast of current trends, styles and technologies. Dustin holds a Bachelor of Fine Arts in graphic design from the University of North Alabama. The magazine front cover is one of the hardest-working pieces of paper in publishing. Dustin McNeal, our decorated art director, reveals the magic behind the best of 2018. A well-crafted style guide is the key to consistent communication with your audience. Print will never die. But it is changing. One way magazines are adapting to their current competitive climate is to show love to pages that in the past would be throwaways. Here, we look at one of these—the Table of Contents.